Lot:8007 1787 Massachusetts Half Cent. Ryder 3-A, W-5920. Rarity-5-. MS-62BN (PCGS). 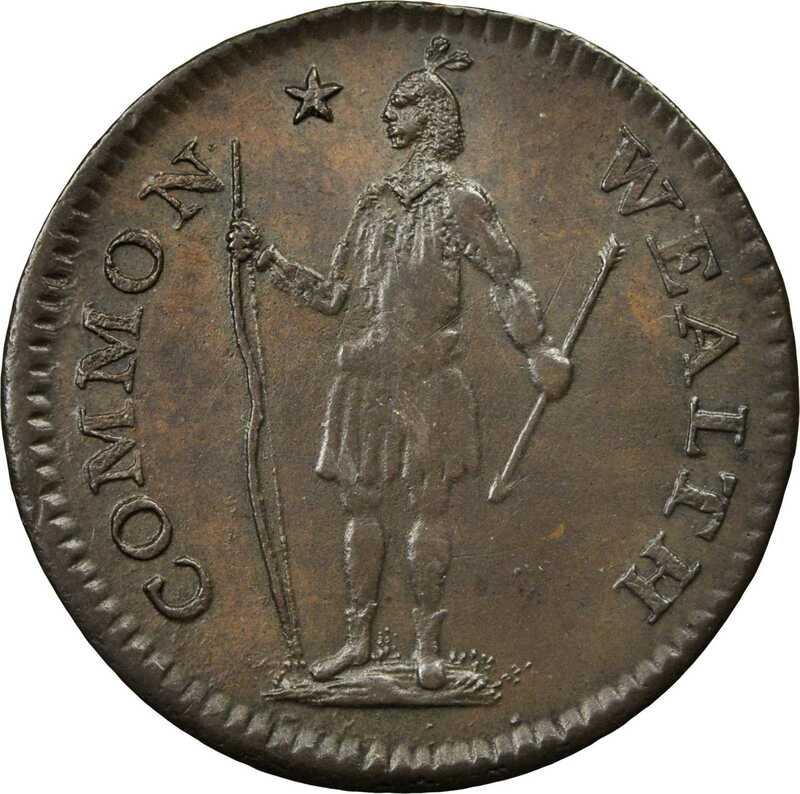 1787 Massachusetts Half Cent. Ryder 3-A, W-5920. Rarity-5-. MS-62BN (PCGS).72.1 grains. Glossy dark chocolate brown throughout. A few light scuffs are noted at the central obverse under magnification; this area is particularly vulnerable. This obverse die was in a state of failure and had sunk in the center, causing a bulge through the center of the struck coin that elevated this area making it a bit more susceptible to handling marks, This also caused weakness of the strike in the centers of both sides. The obverse die was also poorly executed from the outset, with incomplete details in the body of the Indian and the bow arm a bit more skeletal in engraved definition. These technical matters aside, the eye appeal is very nice and the details away from the central Indian and eagle’s shield are sharp. Aesthetically pleasing and with a fine provenance.From the Twin Leaf Collection of Connecticut & Massachusetts Coppers. Earlier ex Virgil M. Brand; B.G. Johnson (St. Louis Stamp and Coin); New Netherlands, privately, April 1953; Robert Schonwalter, Stack’s, January 2003:1025.